Victor Stream Workshop: Session will include an overview of Humanware Blindness & Low Vision products. How will the Intel® Reader help your students? Audio books were a technology breakthrough in education as early as the 1950s. Now, in the 21st century, multiple online resources are becoming widely available and useful to classroom instruction. Instructional materials in digital formats have the potential of being used in a variety of ways and can be adapted to all students in addition to meeting the needs of special populations. In this two-part webinar, we will discuss practical teacher-based applications using online books and e-text files to meet student needs. How has technology made unprecedented educational opportunities available? What has changed over time that made it imperative for educators to know about online books? What do you need to be aware of regarding copyright when accessing digital files for students? What are some tips for tapping the “pipeline” of digital materials for students to access the flow? How do you keep the downloaded files organized? Are there ways to keep everything straight when working with multiple students? Where do you store e-files? Examples of posting material on a school server - the benefits. Trekker Breeze 1.2: More information, more confidence, more travel! Come on a journey that explores what it has been like for two individuals who were diagnosed with a learning disability (LD) in grade school. Brenda and Nina will discuss the importance of early identification of LD, alliance building between teachers, professionals, parents and students, and free resources. Workshop will be held on the second floor, entrance is in the back of the building. Brenda McBride comes to us from Regina, Saskatchewan, Canada and she is one of North America’s preeminent experts on assistive technology. She is also a person who uses assistive technology to address her learning disability. Since the emergence of assistive technology more than 15 years ago, it has become an intricate part of her life. She has worked ten years with adults, children and professionals within the learning disability community, overseeing the office and development programs to help individuals who have fallen through the cracks. Brenda has been involved on the international, national, provincial and local levels to address the needs of individuals with disabilities. She has spoken at CSUN, ATIA, Closing the Gap, TRLD, IDA, LDAC, Springboard and LDA America etc. Brenda brings a wealth of personal and professional experience involving the world of learning disabilities. She shares her experiences with individuals she meets at conferences, presentations, webinars and workshops. She will also share how, as an adult, she uses technology to accommodate her own learning difficulties. Nina Ghiselli, PsyD, is the system-wide director of disability services and adjunct faculty at Alliant International University and a psychologist in private practice in Hayward, California. She also teaches courses at U.C. Berkeley Extension and Argosy University and consults with schools and agencies on how to make their programs more accessible to people with disabilities. Dr. Ghiselli teaches courses on disability law, application the clinical population, effective teaching, and diversity. Her clinical work focuses on adults with disabilities. Stephanie Turner will be speaking about the services that are offred by Recording for the Blind & Dyslexic. We will conclude with a questions and answers session. ClassMate Reader 101: Question and Answer session on the Save as DAISY Add- in for Microsoft Word. Discussion with attendees on how to use this program to best support your students. Discussion will include information on how to download the Save as DAISY WORD add-in and use it to create a DAISY file which can then be copied on the ClassMate Reader. What is an educational therapist and how do you find one for your child? How is Ms. Seidel integrating the use of assistance technology into her practice? What are some strategies and tools you can use with your child/student? Allison B. Seidel, MA, BCET is a board-certified educational therapist practicing in the Bay Area. She was previously an Outreach Coordinator with Recording for the Blind & Dyslexic and presents both locally and nationally on learning disabilities and assistive technology. Have you heard the news about the Intel® Reader? Exciting new opportunities for on the go reading. Learn the five W's of the Intel Reader. Plus opportunities to ask questions, and learn about available resources. Learn how disability-related legislation impacts your rights and the responsibilities of post-secondary institutions. Also, learn about resources you can access for a seamless transition. Discussion will include information on legislation and services that are provided by the Disability Resource Office. We'll take a closer look at how to access textbooks and resources in an accessible format. Answering questions regarding what colleges can do to help ensure smooth transition. Nina Ghiselli, PsyD. is the system-wide director of disability services and adjunct faculty at Alliant International University and a psychologist in private practice. She also teaches courses at U.C. Berkeley Extension and Argosy University and consults with schools and agencies on how to make their programs more accessible to people with disabilities. Dr. Ghiselli, who has a language-based learning disability, teaches courses on disability law, application to the clinical population, effective teaching, and diversity. Her clinical work focuses on adults with disabilities. Exciting new opportunities for on the go reading. Learn the five W's of the Intel Reader. Plus opportunities to ask questions, and learn about available resource. 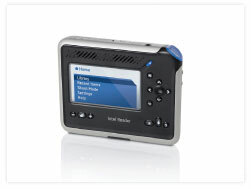 Title: Have you heard the news about the Intel® Reader? Discussion will include information on services for new or returning postsecondary students, individual membership information. We will be exploring the programs and information relating to those working with or studying at the postsecondary level. A ViewPlus Expert and Product Specialist will demonstrate the basic functionality of the Audio Graphic Calculator (AGC). AGC is used to make math accessible to users of all skill levels. This workshop will include plotting data points to create accessible graphs, evaluating expressions and matrices, and performing polynomial regression. The session will last approximately 45 minutes with time for participant questions at the end. Please send AGC questions you would like answered during the session to training@viewplus.com prior to the demonstration. After registrering you will receive a confirmation email containing information about joining the Webinar. Parenting: how to work with "the system" to best provide services for your child. Discussion will include information on unfamiliar terminology, ways to work with the school system before the first report card comes out, resources from the web and videos that will help you understand your child and what it is like to have a learning disability. Also discussed will be the ways to connect with the local support groups in your state or province. If you have any questions, please forward them to info@humanware.com before October 6, 2009. Marion McBride, a mother of four grown children, has worked in public education for the past 20 years. Marion became involved with the Learning Disabilities Association when she was seeking infomation to help her young children in their academics studies. She eventually became Provincial President of the association after working several years with the local chapter. Mrs. McBride helped to organize a Branch office of LDAS, sought grant funding for adult and children's programs and volunteered in other advicacy groups. She has ofganized and presented at conferences, prepared position papers and advicated at the local and provincial governtments and University after learning how to work with her children's educators. Discussion will include terminology you should be famiiar with, current national ligistation, resources for new and returning students. Also discussed vill be the questions you need to be asking at your local libraries. Claudette has a background in social work and has worked in the disability field for the past 22 years, seventeed of them with the Learning Disabilities Association of Canada. As a parent with three adult sons with learning disabilities, Claudette has used her parental experiences as a foundation for her work as Director of Public Policy and Programs, to guide her as a member of several federal government advisory groups and national not for profit groups on policies and programs that impact individuals with learning disabilities, their families and those that support them. Discussion will include information on services for international services offered by Bookshare: membership cost, individual membership information, programs and information relating to people living outside the United States. If you have any questions, please forward them to Brenda.mcbride@humanware.com before September 22, 2009. Viji Dilip serves as the International Program Manager for Bookshare.org. Viji Dilip was responsible for launching Bookshare in India in October 2008. With a deep passion for bringing education and information to the print-disabled community, Viji joined Bookshare in 2007. Her unique combination of education and work experience in both India and in the U.S. has been a great asset in launching Bookshare International. Viji has over fifteen years of experience in the financial field working at the Skoll Foundation, Hewlett Packard and Price Waterhouse in India as well as Internet startup companies. She has an MBA from San Jose State University, a CPA degree from AICPA and is a member of the Institute of Chartered Accountants of India. How is the dyslexic brain different from another brain? What kind of gifts do the dyslexics have? How does technology best work persons who have dyslexia? What is the latest research and information about dyslexia? Pleasant Grove INdependent School District, Texarkana, TX. Rene King has taught in the field of dyslexia and related disorders in the capacity of teacher and therapist from Kindergarten through 12th grade and has also taught college and adult students. Currently, she is the Dyslexia Outreach Coordinator at Pleasnat Grove ISD, and author of "The Second Step, Success Through Technology". She has presented at conferences for the Dallas Branch of the International Dyslexia Association, Academic Language Therapist Association, Region 10 Dyslexia Institute, Scottish Rite Hospital, Houston ISD, and Yale Center for Dyslexia and Creativity. What's new at RFB&D? AudioPlus Downloadable DAISY! User Authorization - New Processes (How to)! Discussion will include information on legislation and services that are provided by the Disability Resource Office. Take a closer look at how to access textbooks and resources in an accessible format. Answering questions regarding what colleges can do to help ensure smooth transition. Discussion will include information on services for returning or new postsecondary students, individual membership's information, and programs and information relating to returning to school. Stephanie Turner will be speaking about the services that are offered by Recording for the Blind and Dyslexic as well as a sharing time from questions. Yyou might have question for Recording for the Blind and Dyslexic? Please forward these to info@humanware.com or sturner@rfbd.org before July 7th, 2009. May 26, 2009 8:30 A.M. - 12:00 P.M. This half day training will review features of the Classmate Reader, Victor Reader and Victor Reader Stream. Content will include information on learning strengths and differences and structured support for reading comprehension along with proven strategies from "Classroom Instruction that Works". Strategies will be shared on how teachers can obtain or create accessible instructional materials and how teachers can implement the use of these materials in their classes. A feature match approach will be shared to introduce different aspects of the Classmate Reader. The objective of this session it to look at ways to improve reading comprehension with examples of strategies and resources designed for teachers. How do you break down the task of reading comprehension while looking at the needs of struggling readers? Featuring guest speaker Elizabeth Walcot Researcher: Educator, Tutor and Advocate. We will look at transitioning from high school to postsecondary studies and engage in a discussion with individuals who are in the postsecondary environment. We will also take a look at what individuals will need in order to access services from Bookshare while pursuing post secondary studies. READHOWYOUWANT objective is to work with publishers to provide their content in accessible formats at the time of publication at a fair price. They represent a wonderful resource for accessible books. Learn about their services, online accessibility, as well as how to transfer books onto your ClassMate Reader or Stream. HumanWare is pleased to announce a focused presentation on the ClassMate Reader on how to transfer material onto our units. We will also take a look at on line resources and valuable information on the new Companion Software. The goal of this presentation is to share Bookshare's international efforts to increase access to digital books for people with print disabilities around the world. Mario and Viji will discuss Bookshare's growing international library of over 7,000 books and the benefits that come with a Bookshare membership. HumanWare is pleased to have a discussion with Stephanie Turner about the services that are offered by Recording for the Blind and Dyslexic. Topics discussed will include basic information about membership, player authorization, services offered by RFBD and research. How do you become a member of RFB&D? Looking at the research supporting the use of audio books for students who are struggling with reading. HumanWare is pleased to announce a focused presentation on the ClassMate Reader and what is new in version 1.2. We will also take a look at tutorial information and valuable resources on the website. During this presentation Mario will discuss a variety of benefits that come with a Bookshare.org membership including access to over 41,000 educational books, leisure reading, special collections, and periodicals. He will discuss the impact of Bookshare.org in schools and education and how membership is now FREE for all students of any age through an award from the U.S Department of Education, Office of Special Education Programs. And he will discuss how books are downloaded from the Bookshare.org library and read with assistive technology. HumanWare is pleased to have a discussion after a year of implementation using assistive technology within a curriculum for college bound students that have severe learning disabilities. The presentation will take an in-depth look at the lives of 30 severely learning disabled students after a year's implementation of assistive technology and it appropriate use. With this school and students not having used assistive technology support in the past, what can we learn from this experience? Audio presentation by Gerry Chevalier and Mike Gibson (23 July 2007) at Accesssible World's Tech Talk event.